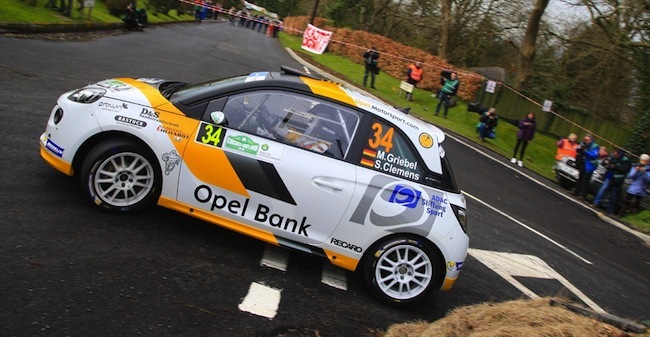 Opel’s ADAC Opel Rallye Junior Team is readying themselves for the next leg on the FIA ERC Junior Championship calendar, the SATA Rallye Acores in Portugal. Swedish Opel works driver Emil Bergkvist leads the series in points as it heads to the gravel surface rally, which is to be run on a group of islands about 1,400 km (869 miles) off the European coast. Opel says the dirvers of its Adam R2 works racecar are “well prepared” for Rallye Acores. Bergkvist “started his career” on gravel rally courses at home in Sweden, and he and co-driver Joakim Sjöberg recently won their class at the gravel South Swedish Rally. A week later, his Opel teammate Marijan Griebel was poised for a podium position at the WRC leg in Portugal, but suffered a late-race puncture and was forced to retire. The SATA Rallye Acores is set to kick off on June 4, with the first leg being carried through to Friday. The second leg will start Saturday morning and is not scheduled to end until 7:00 p.m. later that night. Next story Community Question: What Do You Want To See From The 2016 Chevrolet Cruze?